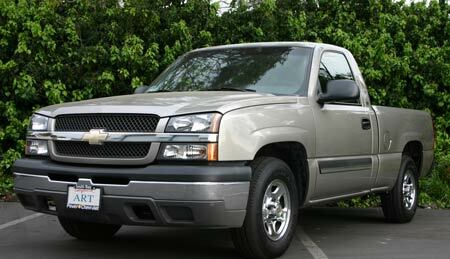 kit in a 2003 Chevrolet Silverado pickup. Having power door locks and keyless entry is practically a necessity these days. We're going to show you how easy it is to install a remote controlled keyless entry with an MES central door locking system. The current kit is the W01F-712T. Note that we also carry systems for cable locks, 4 door cars & trucks, etc. See our Keyless Entry and Lock page for more listings. The MES central locking system is great. The actuators and central locking module are made in Switzerland. Much better quality than the Taiwan made stuff being sold elsewhere. Central locking basically means that by locking or unlocking either of the doors, the opposite door will also lock or unlock. This works whether you are using the key or flipping the interior knob. This type of system eliminates the need for switches in many vehicles. The kits include almost everything necessary for a successful power door lock and keyless entry installation. You may, however, find it necessary to purchase misc. wiring connectors, electrical tape, solder, etc. from a local auto parts store.